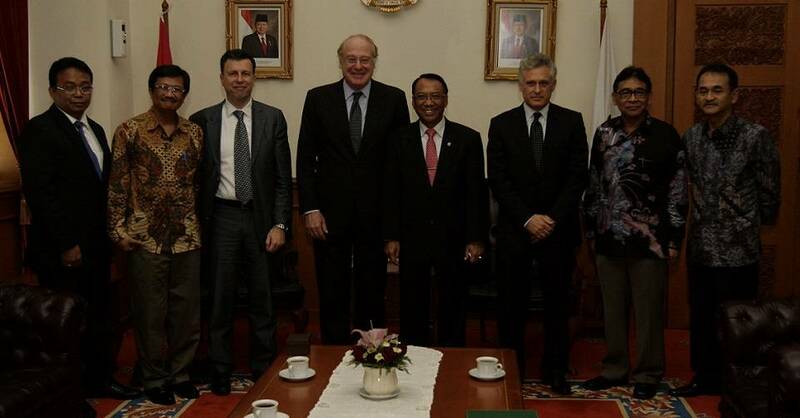 The Indonesian Minister of Energy, Jero Wacik, and Eni’s CEO, Paolo Scaroni, met today in Jakarta to discuss Eni’s activities in the country. During the meeting, Paolo Scaroni updated the Minister of Energy on the progress of ongoing projects, which are considered strategic for both Eni and the Indonesian Republic. In particular, Paolo Scaroni has illustrated the importance of the project Jangkrik Complex, operated by Eni and located in the East Kalimantan deep waters, where production is expected to start less than seven years after the discovery. Eni is also participating in the development of significant gas reserves located in the Ganal and Rapak blocks, close to the Jangkrik discovery. Gas production from these projects will be sent to the existing liquefaction plant of Bontang. Eni holds working interests in 13 permits and operates nine of them, located in the Tarakan and Kutei Basins (West Kalimantan), north of Sumatra, West Timor and West Papua. Eni is active in the Mahakam Delta region, East Kalimantan, where it is the operator, through the company VICO Ltd (Eni 50%, BP 50%), of Sanga Sanga field where Eni has equity production of approximately 18,000 barrels of oil equivalent per day. In this area Eni has been awarded a new coal-bed methane production sharing contract (PSC), through its operated joint venture affiliate VICO CBM Limited (Eni 50%, BP 50%).